Monday was hot and steamy and very busy for us. We were all tired, and desperately needed something very easy, but delicious for dinner. I had a heap of broccoli and some mushrooms to use up, so when I found Nava Atlas’s recipe for Quesadillas with black beans, broccoli and portabellas I thought I’d hit the jackpot, because I also had tortillas and two cans of black beans in the pantry. This was going to be a breeze! Then I realised I really wanted to use the vegan cheese so it would be nice and melty. And we had none. I could have done without it, but I just couldn’t get it out of my mind. I mustered every bit of energy I could, and resolved to make a trip to the shops to buy a bag of Daiya cheddar cheese. My exhausted brain was struggling to think of anywhere REALLY close to buy Daiya (remember, it was hot, and I was so exhausted I couldn’t even make the couple of K’s to Mad Cowgirls). Then it came to me…I’d recently noticed a new shop on the corner of Mitchell and High Streets – I was sure it stocked Daiya! This view is from Mitchell Street, but the shop is on High Street, just near the IGA. The shop, I soon found out, is called Great Earth. 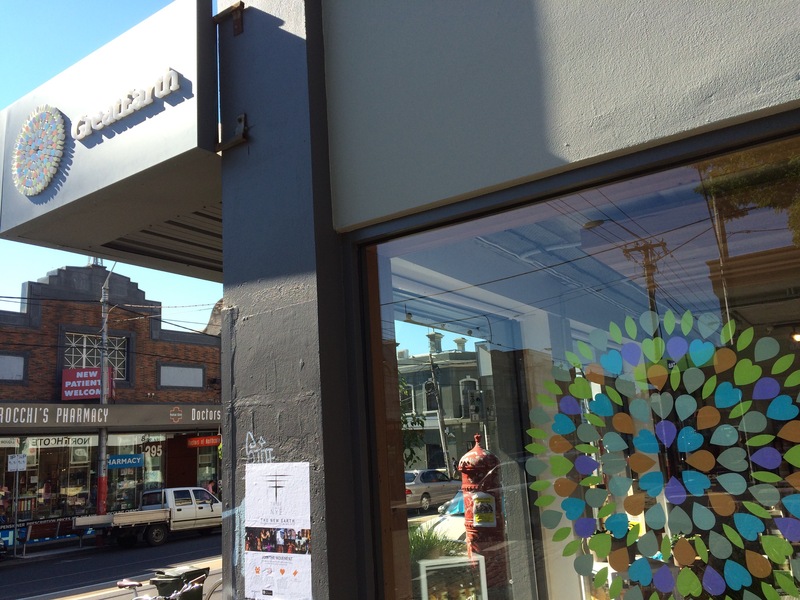 It’s one of 8 Great Earth shops in Melbourne. I hadn’t heard of them before, but they stock quite a few vegan items – although they mainly seem to focus on supplements. H has a weakness for supplements, so she was pretty awestruck as she wandered among the shelves. We’re looking forward to getting back for a closer look when we’re not so hot and bothered. When I got home I put together a green salad, and the quesadillas, being sure to cook the mushrooms separately from the broccoli, because H HATES mushrooms and would have refused to eat it. 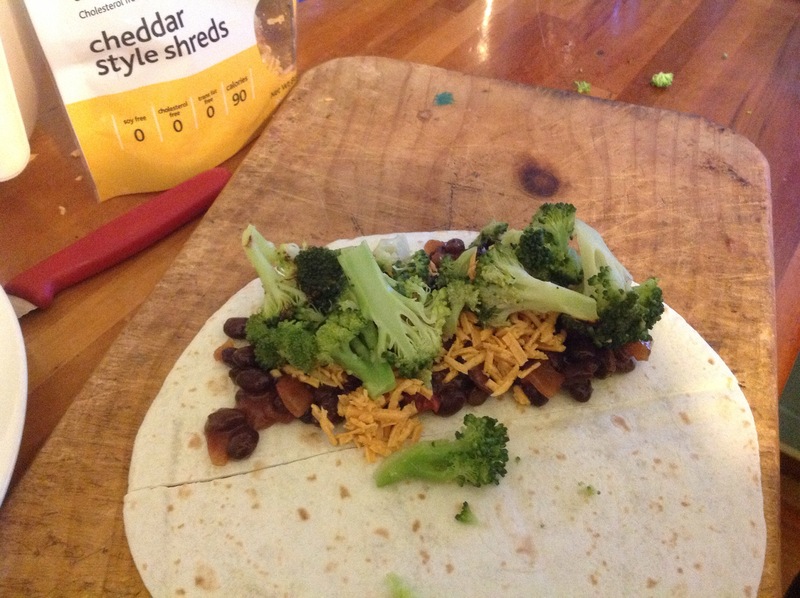 I layered the bean mixture, Daiya cheddar cheese, mushrooms and broccoli onto each tortilla, topped them all with another tortilla, then I cooked them in a sandwich press until they were nice and brown and crisp. Then I smashed on some avocado and scattered a bit of fresh coriander – but we used up all of that on our first quesadillas. The first ones were beautifully presented! No picture! Well, not an appetising one, anyway. 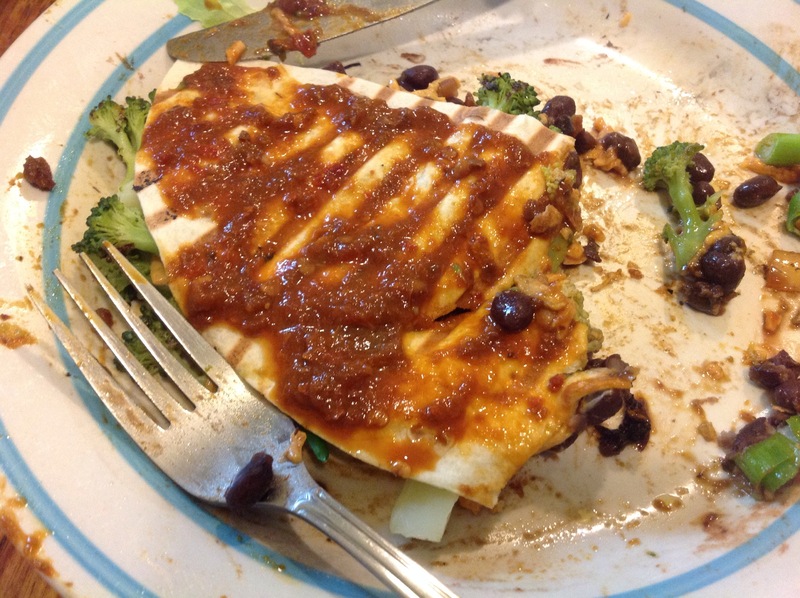 True to form, I totally forgot to take a photo…can you blame me?…I was REALLY hungry and it was really, really good! Look away from the next picture if you have a weak stomach! Sadly I can only show you a picture of P’s third tortilla, which is smothered in our favourite chilli sauce and (this is why I’m most sorry) is also half eaten! The salad is long gone, but I promise it was there, and it was good. At least you can be sure that if we were eating so hungrily on such a hot and humid day, it was really tasty! This was a really simple recipe – as long as you have all the ingredients to start with! It was also filling, nutritious and delicious. We had 2 each – actually P had 3! I’ll definitely be making these again, especially over the summer when everything’s a bit more casual and I don’t want to spend hours in a hot kitchen. I could probably even cook them on the new barbecue!